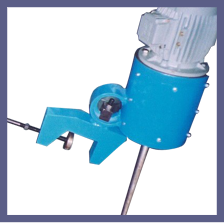 We offer our customer wide rage of top entry agitators for various process duties. These agitators are suitable for structural mounting for standard ASA 150 # rating flanges as per requirements. Both models are equipped with Mechanical seal with shut off Seal arrangement to enable seal maintenance without emptying tank. 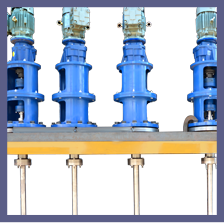 For smaller tanks we offer clamp mounted ,fixed mounted and hanging type mixers suitable for various process and with gear driven or direct driven high speed arrangement. 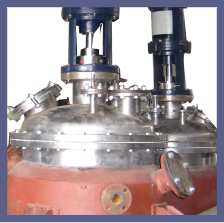 We manufacture Reactors with limpet coil , jacket as per requirements , designed as per ASME codes with or without polishing ( inside / outside ) as per customers requirements. 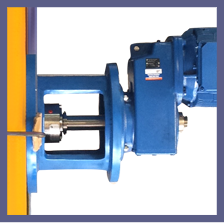 We can supply these equipments from 50 l capacity onward & drive range from 0.25 Hp to 75 Hp. The material of construction can be SS 304, SS 316, SS 304l, SS 316L or carbon steel as per the process requirements. These equipments can also be supplied with specific surface finish requirements like dairy finish to 180 grit or mirror finish. • Water Treatment and Effluent Treatment. The strong base of design knowledge, supportive vendors, enthusiastic execution team, needful manufacturing setup enables Helix to meet any of the stringent quality requirement of the project set by our customers. •	Liquid – gas mixing – Gas dispersion. •	High shear mixing . During the stage of design proper selection of impeller from different type of impellers listed above is carried out and sizing is done to suit the operating conditions and process requirements. In the Year 2000 HELIX started as partnership firm with a mission to design, manufacture and supply the superb quality , power Efficient Agitator, Impellers and Reactors with optimized design. In the year 2015 after completing fifteen years in Business Successfully we have moved on to form Helix Process Equipments Pvt .Ltd. © Copyright 2015 Helix Process Equipments Pvt. Ltd.